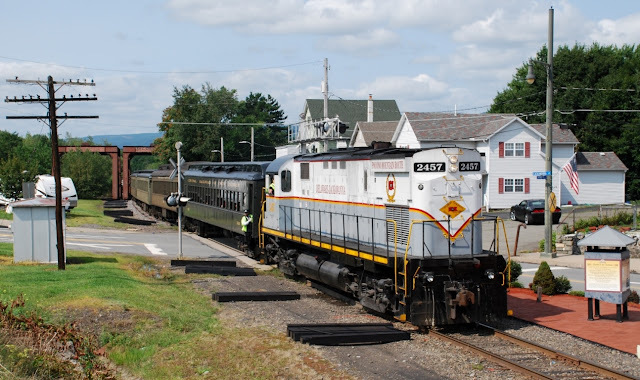 On Saturday the Lackawanna Heritage Valley organization sponsored their annual "Heritage Explorer Train" to Carbondale for the town's Pioneer Days Festival. Motive power for the train's five coach consist was DL 2457 (C425 ALCO). The train was scheduled to depart from Scranton at 10 AM. The first image was taken in Olyphant around 11 AM as it passed over the South Valley Avenue grade crossing. With the train's passing I hurried off to my next photo location which was Archbald. Upon my arrival I noticed what looked like a person laying in the track's gauge. Walking over to this person I nudged him with my foot and got no reaction. Again I nudged him and this time he woke up in a dazed state. I told him a train was coming and his reply was "I want to sleep!" Being persistent I kept telling him he had to move and eventually he did. The way he staggered about after leaving the ROW I had to wonder if it was drugs or a hangover that put him in that condition. It was sad to see this young man, perhaps in his mid-twenties, in that state and cast a somber note to this day of my being trackside. On the other hand being there and getting him off of the tracks avoided a potential tragedy. As I was hoping to photograph the NS's CNJ heritage unit leading intermodal 20E on this sun filled morning. First train through was what I thought was NS's 212 having NS 7670, NS 8095 and NS 7680 as its power consist and passing by around 8:11 AM. It would be about another hour before the CNJ's headlight appeared in the distance. Leading was NS 1071 followed by NS 2503 and NS 1010. Unfortunately for me some clouds partially obscured the sun as the train passed by and effectively reduced illuminating the scene. Of the two images one has to admit that the image of 212 is a much more pleasing photo due to more sunshine than the 20E, wouldn't you agree? NORFOLK, Va., Aug. 17, 2017 -- As skygazers prepare for the first total solar eclipse in the continental U.S. since 1979, Norfolk Southern (NYSE:NSC) is encouraging viewers to stay away from railroad tracks. Norfolk Southern trains run around the clock in all weather and lighting conditions and will continue to operate during the Aug. 21 eclipse. The full solar eclipse will be visible from seven states across Norfolk Southern’s 22-state network, while a partial eclipse will be seen across the railroad’s entire system. The full eclipse will last two minutes and 30 seconds. In that time, a freight train traveling 50 mph can cover 2.1 miles and take more than a mile to come to a complete stop. Walking on or close to railroad tracks is dangerous and illegal. Many rail cars extend up to six feet beyond the rails. “We want you to remain safe while viewing this historic event. If you are near railroad tracks and distracted by the eclipse, you are putting yourself in serious jeopardy,” said Chip Feininger, Norfolk Southern’s system safety coordinator. Those seeking optimal views of the eclipse should not walk on or beside railroad tracks or climb railroad trestles. Cross tracks only at designated rail crossings. In addition, motorists should not attempt to view the eclipse while driving or stopping their car near the tracks for a better view. According to the Federal Railroad Administration, 977 people nationwide in 2016 were injured or lost their lives after being struck by a train while trespassing on or near railroad tracks. One Weekend Only - Visit WoodsEdge Farm on BR&W Railroad! Ride the all new "WoodsEdge Express"! Seating is limited and tickets are selling fast! NEW for 2017, a unique experience for the whole family, presented by BR&W in partnership with WoodsEdge Farm. Ride the train from Ringoes to Bowne Station, where you'll hop on the covered wagon for a visit to WoodsEdge Farm! Visit our website for details and tickets! NORFOLK, Va., Aug. 14, 2017 – Norfolk Southern Corporation (NYSE: NSC) today announced that, following a comprehensive search process, its board of directors has appointed Cynthia C. Earhart as executive vice president and chief financial officer, effective Aug. 15, 2017. Earhart succeeds Thomas E. Hurlbut, NS’ vice president and controller, who has served as interim chief financial officer since Aug. 1, 2017, following the retirement of Marta R. Stewart. Earhart, a certified public accountant, joined NS in 1985 and most recently served as executive vice president and chief information officer. In connection with her appointment as CFO, Earhart will retain her information technology responsibilities. Since joining NS’ accounting department in 1985, Earhart held positions of increasing responsibility in the accounting department, including assistant vice president, before transitioning to information technology. She was named vice president, information technology in 2001. In 2007, Earhart was named vice president human resources, and in 2013, she was appointed executive vice president administration. She assumed expanded responsibilities as executive vice president, administration and chief information officer in 2015. Earhart, a certified public accountant, began her career at NS following her service as an accountant at Ernst & Young’s predecessor CPA firm Ernst and Whinney. She earned her Bachelor of Science degree in accounting from the University of Missouri and has completed the Advanced Management Program at Harvard Business School. 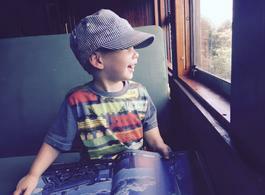 Summer is almost over; enjoy one of our August events at BR&W Railroad! August Events at BR&W Railroad! Summer is almost over, but there's still plenty to do at BR&W Railroad this August! 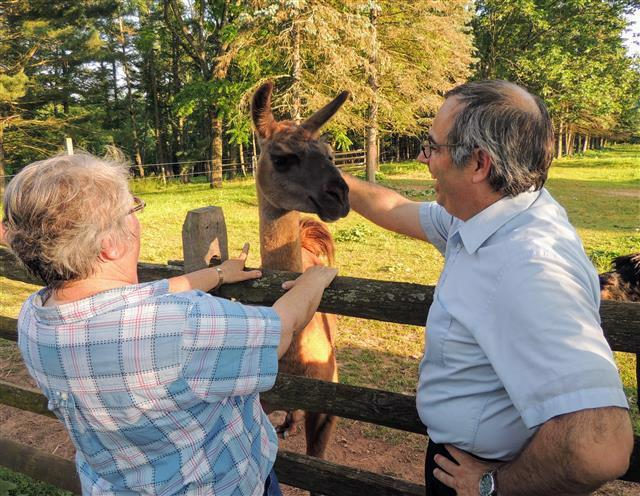 Story Time Express is back this August 12 with an updated program featuring a trip to Bowne Station and a chance to meet some of the animals from our neighbors at WoodsEdge Farm! Details and tickets available on our website. 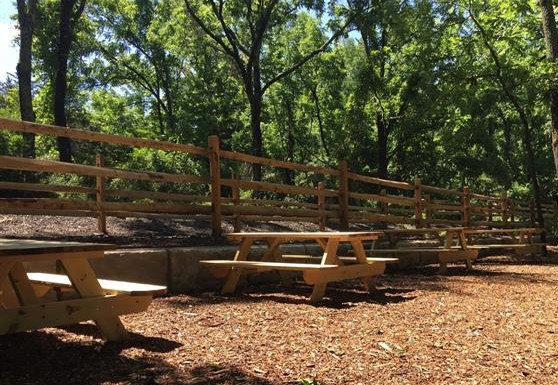 NEW for 2017, ride the Picnic Train to Bowne Station for a peaceful summer picnic at our beautiful shaded grove! Visit our website for details and tickets! 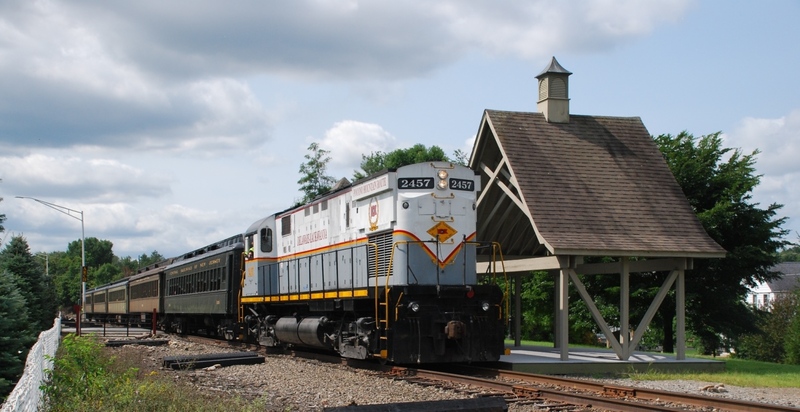 Our Summer Excursions and the NEW " Bowne Station Local" are now operating most Saturdays and Sundays! 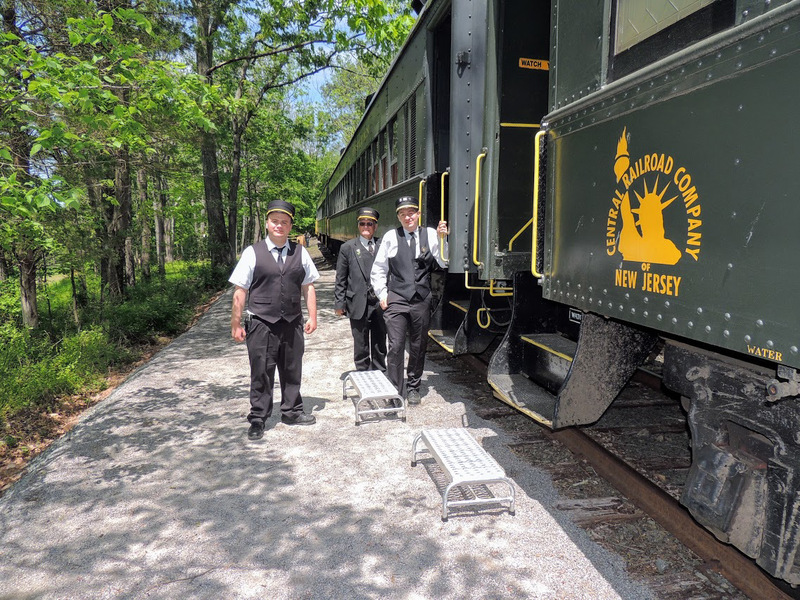 On the Bowne Station Local, ride our newly rehabilitated railroad 2.5 miles from Ringoes towards Lambertville to our new stop at Bowne Station! Details and tickets available on our website! These trains run most Saturdays & Sundays through Labor Day! NORFOLK, Va., July 31, 2017 — Norfolk Southern Corporation (the "Company") announced today the commencement of offers to certain eligible holders (together, the "Exchange Offers") of the Company's outstanding debt securities listed in the table below (together, the "Existing Notes") to exchange Existing Notes for consideration consisting of cash and up to $600,000,000 aggregate principal amount of the Company's new Notes due 2052 (the "New Notes"), the complete terms of which are set forth in an offering memorandum, dated today (the "Offering Memorandum"), and the related letter of transmittal, dated today (together with the Offering Memorandum, the "Offering Documents"). (1) All Existing Notes tendered for exchange in the Exchange Offers on or before the Early Exchange Date (as defined below) will have priority over any Existing Notes that are tendered for exchange after the Early Exchange Date. (2) Maximum aggregate principal amount of Existing Notes of such series to be accepted for exchange in the Exchange Offers. (3) The “Cash Payment Percent of Premium” is the percent (as set forth with respect to each series of Existing Notes in the table above) of the amount by which the Total Exchange Consideration (as defined below and calculated at the Pricing Date [as defined below]) exceeds $1,000 per $1,000 principal amount of such Existing Notes. (4) Per $1,000 principal amount of Existing Notes. (5) Holders who validly tender Existing Notes after the Early Exchange Date but on or before the Expiration Date (as defined below) will not be eligible to receive the “Early Exchange Premium” of $30 principal amount of New Notes for each $1,000 principal amount of Existing Notes validly tendered and not validly withdrawn. The aggregate principal amount of New Notes to be issued pursuant to the Exchange Offers will be subject to a maximum amount of $600,000,000 aggregate principal amount (the "New Issue Cap"). In addition, the principal amount of each series of Existing Notes that is accepted pursuant to the Exchange Offers will be subject to the "acceptance priority level" (in numerical priority order) and, in certain cases, a “Series Tender Cap” of such series as set forth in the table above and as further described in the Offering Documents. All Existing Notes that are tendered for exchange in an Exchange Offer on or before the Early Exchange Date will have priority over Existing Notes that are tendered for exchange after the Early Exchange Date. If the principal amount of Existing Notes validly tendered on or before the Early Exchange Date constitutes a principal amount of Existing Notes that, if accepted by the Company, would result in the Company issuing New Notes having an aggregate principal amount equal to or in excess of the New Issue Cap, the Company will not accept any Existing Notes tendered for exchange after the Early Exchange Date (even if they are of acceptance priority level 1). The Exchange Offers will expire at 11:59 p.m., New York City time, on August 25, 2017, unless extended by the Company (the "Expiration Date"). a cash payment equal to the Cash Component. The Total Exchange Consideration and Exchange Consideration may be adjusted as described in the Offering Documents. In addition to the Total Exchange Consideration or Exchange Consideration, as applicable, Eligible Holders with Existing Notes that are accepted for exchange will receive a cash payment representing (i) all or a portion of the accrued and unpaid interest to, but not including, the applicable Settlement Date (as defined below), and (ii) amounts due in lieu of any fractional amounts of New Notes, in each case, as further described in the Offering Documents. The “Pricing Date” will be 11:00 a.m., New York City time, on August 14, 2017, unless the Early Exchange Date is extended, in which case a new Pricing Date may be established with respect to the Exchange Offers. In the event that the Early Exchange Date is not extended, the Pricing Date will remain the same. The “Total Exchange Consideration” (calculated at the Pricing Date) for the Existing Notes validly tendered prior to the Early Exchange Date, and not validly withdrawn prior to the Withdrawal Deadline, is equal to the discounted value (calculated as set forth in the Offering Documents) on the expected Early Settlement Date of the remaining payments of principal and interest (excluding accrued interest) per $1,000 principal amount of the Existing Notes through the applicable maturity date or par call date (as applicable) of the Existing Notes, using a yield equal to the sum of: (x) the bid-side yield on the applicable Reference U.S. Treasury Security set forth with respect to each series of Existing Notes in the table above plus (y) the applicable fixed spread set forth with respect to each series of Existing Notes in the table above. The Total Exchange Consideration includes the Early Exchange Premium. The “Exchange Consideration” for the Existing Notes validly tendered after the Early Exchange Date but prior to the Expiration Date is equal to the Total Exchange Consideration minus the applicable Early Exchange Premium. The “Cash Component” means the portion of the Total Exchange Consideration to be paid to Eligible Holders in cash and is equal to (x) the applicable Cash Payment Percent of Premium for such series of Existing Notes multiplied by (y) (i) the applicable Total Exchange Consideration for such series of Existing Notes minus (ii) $1,000. The Company will pay interest on the New Notes at a rate per annum equal to the yield, calculated in accordance with standard market practice, that corresponds to the bid-side price of the 3.000% United States Treasury due February 15, 2047 as of the Pricing Date, as displayed on the Bloomberg Government Pricing Monitor page PX1 plus a fixed spread of 125 basis points. Eligible holders who validly tender and who do not validly withdraw their Existing Notes at or prior to 5:00 p.m., New York City time, on August 11, 2017, unless extended by the Company (the "Early Exchange Date"), and whose tenders are accepted for exchange by the Company, will receive the Total Exchange Consideration for each $1,000 principal amount of Existing Notes. Eligible holders who validly tender Existing Notes after the Early Exchange Date but prior to the Expiration Date, and whose Existing Notes are accepted for exchange by the Company, will receive the Exchange Consideration, which is the Total Exchange Consideration minus the Early Exchange Premium of $30.00 per $1,000 principal amount of Existing Notes tendered and accepted for exchange. The cash payable to each holder whose Existing Notes are accepted for exchange will be adjusted as applicable by the accrued and unpaid interest on those Existing Notes and New Notes, to but not including the applicable Settlement Date. Tenders of Existing Notes in the Exchange Offers may be validly withdrawn at any time at or prior to 5:00 p.m., New York City time, on August 11, 2017, unless extended by the Company (the "Withdrawal Deadline"), but will thereafter be irrevocable, except in certain limited circumstances where additional withdrawal rights are required by law. Consummation of the Exchange Offers is subject to a number of conditions, including (i) the issuance of at least $300,000,000 aggregate principal amount of New Notes, (ii) favorable tax and accounting treatment for the Exchange Offers, and (iii) the absence of certain adverse legal and market developments. The Company will not receive any cash proceeds from the Exchange Offers. Subject to applicable law, the Company may in its absolute discretion terminate any Exchange Offer for any reason or for no reason. If and when issued, the New Notes will not have been registered under the Securities Act of 1933, as amended (the "Securities Act"), or any state securities laws. The New Notes may not be offered or sold in the United States or to any U.S. persons except pursuant to an exemption from, or in a transaction not subject to, the registration requirements of the Securities Act and applicable state securities laws. The Company will enter into a registration rights agreement with respect to the New Notes. The New Notes will be unsecured obligations of the Company and will rank pari passu with all other unsecured and unsubordinated indebtedness of the Company. The Exchange Offers are only made, and copies of the documents relating to the Exchange Offers will only be made available, to a holder of Existing Notes who has certified in an eligibility letter certain matters to the Company, including its status as a "qualified institutional buyer" as defined in Rule 144A under the Securities Act or who is a person other than a "U.S. person" as defined in Rule 902 under the Securities Act. Holders of Existing Notes who desire access to the electronic eligibility form should contact D.F. King & Co., Inc., the information agent for the Exchange Offers, at 800-431-9645 (U.S. toll-free), 212-269-5550 (collect), or at nsc@dfking.com. Holders that wish to receive the Offering Documents can certify eligibility at www.dfking.com/norfolksouthern. This news release does not constitute an offer or an invitation by the Company to participate in the Exchange Offers in any jurisdiction in which it is unlawful to make such an offer or solicitation in such jurisdiction. This press release contains forward-looking statements about Norfolk Southern Corporation, including those related to the offering of New Notes and whether or not Norfolk Southern Corporation will consummate the Exchange Offers. Forward Looking Statements may be identified by the use of words like “believe,” “expect,” “anticipate,” “estimate,” “plan,” “consider,” “project,” and similar references to the future. Forward-looking statements reflect Norfolk Southern’s good-faith evaluation of information available at the time the forward-looking statements were made. These forward-looking statements are subject to a number of risks and uncertainties, and our actual results may differ materially from those projected. Please refer to Norfolk Southern Corporation’s annual and quarterly reports filed with the SEC for a full discussion of those risks and uncertainties we view as most important. Forward-looking statements are not, and should not be relied upon as, a guarantee of future performance or results, nor will they necessarily prove to be accurate indications of the times at or by which any such performance or results will be achieved. As a result, actual outcomes and results may differ materially from those expressed in forward-looking statements. We undertake no obligation to update or revise forward-looking statements.